Ninety-eight years ago tomorrow, the deciding vote was cast in the Tennessee House of Representatives by Rep. Harry T. Burn of McMinn County. But then the moment came when Harry T. Burn changed his mind, cast his vote and broke the tie. What changed young Harry T. Burn’s mind, or so the story goes, was a note he received. Dated the 17th of August 1920, it was a note both utterly mundane and utterly earthshaking. It was a note from his mother. Then it’s back to routine matters. The sale of a house. Getting ready for a wedding. Someone being sick. “Mama” was Phoebe (or Febbie) King (Ensminger) Burn. Born in Tennessee 23 November 1873,8 she married James Lafayette Burn the day after Christmas in 1894.9 Harry was the first of their four children. Phoebe, or Febb, … held a degree from U.S. Grant University, now Tennessee Wesleyan University, unusual for women of her day. … (H)er husband was stationmaster at Mouse Creek (Niota) for the East Tennessee, Virginia and Georgia Railway. He was founder of Crescent Hosiery Mill and associated with the Bank of Niota. After her husband passed Febb ran the family farm, which she renamed to “Hathburn” … She was an important influence in all her children’s lives and passed away in 1945. Febb served as a local school teacher, attended Niota Methodist Church, and was an avid reader. She read three newspapers each day, enjoyed magazines, novels and classic books and was a supporter of suffrage for many years, following those she called “the militants” and other leaders of the women’s movement. Burn was quoted later in life as saying that, in the end, he couldn’t vote against suffrage for women when his college-educated mother was denied the vote while illiterate tenant farmers in the district he represented could vote. So maybe it wasn’t the note from his mother that made the difference. But he had it in his pocket when he voted. Surely he listened to his mama. Thank you, Harry T. Burn. And a big thanks to you, Phoebe King Ensminger Burn. Even if the note itself didn’t make the difference, you did. You raised a good boy indeed. 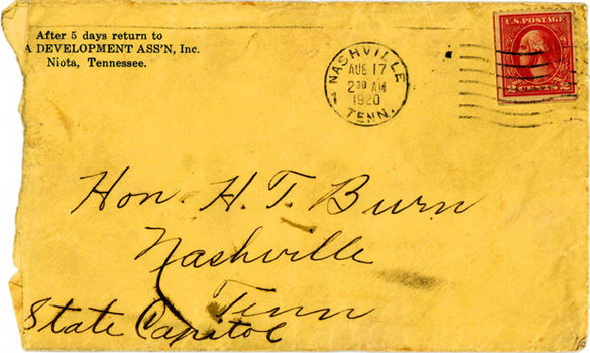 Image: Envelope, Letter to Harry Burn from Mother, Knox County (Tenn.) Public Library. Great story! A good mother is hard to ignore. So glad young Harry Burn listened to his Mama. What a marvellous historical story! How wonderful his mother’s letter was saved! Love these treasures. Thanks for the link. I just recently heard this story for the first time while in Nashville at the Capital. Apparently, Mr. Ryman (Ryman Auditorium) changed his wicked ways, also thanks to his mother (& Rev. Jones)! Hooray for all the mamas! Really liked this one Judy. My Dad told me one time to “always listen to your Mother”, she is one of the smartest people I know! Sometimes when I had a problem, Mother would not say anything or offer any advice unless I said “What do you think I should do”? Hello, I am a great-grand nephew of Harry T. Burn and a great-great grandson of Febb Ensminger Burn. I am publishing a comprehensive biography of Harry to celebrate the centennial of the 19th Amendment. The History Press will be publishing my book in spring 2020. I will tell the entire story of his role in the ratification of the amendment, including debunking the myths and apocryphal stories that persist to this day. Everything there is to know about his mother Febb Burn, and the rest of his family and communities, will feature.